The field of climate science seems to contain many examples of alarming runaway feedback loops, vicious cycles, and previously unimagined detrimental synergistic effects arising within Earth systems—for example, the albedo effect with regard to melting sea ice; or melting permafrost releasing more methane to further accelerate the melting process. New research by a team from Columbia University continues in this vein with results from their recent study published in Science Advances. The study, "Projected increases in intensity, frequency, and terrestrial carbon costs of compound drought and aridity events," shows that the compound effect of soil moisture (SM) and vapor pressure deficit (VPD) on terrestrial carbon uptake is greater than the effect of either variable when considered separately, and that these two conditions tend to mutually reinforce each other. Drought and excessive heat are two forms of extreme weather that have had, and will continue to have, a major impact on natural systems as well as human communities and systems that rely on them. A third climate dynamic, atmospheric aridity, is a combined measure of both temperature and atmospheric humidity, encapsulated in the metric of VPD. SM and VPD are both recognized indicators of carbon uptake and water use by plants in times of drought, and extreme occurrences of both of these indicators—high VPD or low SM—are known to trigger plant stomata to narrow or close, thus limiting carbon uptake. VPD and SM are conditions that are also known to co-occur, and while they have often been evaluated independently in the past, an important goal of this study was to better understand the relationship between the two variables occurring in concert. The compound effects of VPD and SM have been characterized by the investigators as "driven by a series of complementary physical processes," of which low SM contributes to decreased evapotranspiration. Reduced evapotranspiration in turn leads to increases in temperature and higher VPD (because of decreased evaporative cooling and near-surface humidity). Increased VPD drives further evapotranspiration, which in turn accelerates decreases in SM. The co-occurrence of VPD and SM in this vicious circle has been on the rise since the mid 20th century, and these co-occuring events have increased in frequency and intensity. This pattern is predicted to continually increase into the foreseeable future in tandem with warming trends. In exploring the relationship between SM and VPD, Zhou and colleagues also looked at their effect on future climate scenarios, especially with regard to how observed data corresponded to several Earth system models (ESMs), in terms of their accuracy in relation to both past historical simulations and future climate simulation predictions. Specifically, their study showed that: "(i) compound VPD and SM extremes occur much more frequently than expected if VPD and SM were not intimately coupled, (ii) this co-evolution of drought and aridity results in substantial ecosystem carbon losses, and (iii) the impacts of these compound extremes will strengthen in the future." In testing their hypotheses, Zhou and colleagues collected daily observations data from 66 flux tower sites, mostly located in low- and mid-latitude locations, and evaluated the relationship among SM, VPD, net ecosystem productivity (NEP), gross primary productivity (GPP), and total ecosystem respiration (TER). NEP is a measure of of the terrestrial carbon budget, while GPP and TER are constituent metrics of NEP, representing photosynthesis and respiration, respectively. Statistical analysis of these data confirmed a strong and bimodal correlation between SM and VPD at both extremes; that is, low SM and high VPD tended to co-occur as did high SM and low VPD. Moreover, they found that low SM-high VPD events tended to co-occur about twice as frequently as each variable considered independently, and that low SM-high VPD conditions tended to become more tightly coupled as they grew more extreme. In the presence of extreme low SM-high VPD conditions, GPP and NEP both decreased, while TER remained relatively stable. To compare and verify their observations from the flux tower data, the group examined centennial simulations of historical (1871-1970) and projected future (2001-2100) climate conditions vis-a-vis 15 ESMs. These ESMs confirmed the negative correlation between SM and VPD and allowed the researchers to map areas of the globe in which the probability multiplication factor, the primary statistical measure of this study, was particularly pronounced. Of note, the southeastern US, the Amazon region, Southern Africa, and East and Southeast Asia all demonstrated strong SM-VPD interaction in both historical and future ESM models. These ESM models predicted increases in both frequency and intensity of compound SM-VPD events, which will have a significant global impact on continental carbon sink capacity. In evaluating this future impact of extreme VPD-SM in the ESMs, the investigators projected a decline in carbon uptake. With regard to most non-boreal regions between 50 degrees north latitude and 50 degrees south latitude (where most of the flux tower data were collected), TER decreased. Both GPP and TER as affected by VPD-SM compound events were associated with "negative NEP anomalies… over more than 75% of the land area during the two [historical and future ESM simulation] periods." In summary, "tremendous projected increases in the co-occurrence rate and magnitude of concurrent VPD and SM extremes in many regions globally" will result in drastic reductions in ecosystems' carbon uptake capacity. ESM data also showed that NEP anomalies resulting from compound extreme SM-VPD events were much stronger than anomalies resulting from extreme events stemming from only one of these variables. Results differed regionally In assessing the additive effects of one extreme variable versus another in relation to carbon uptake in the context of historical and future simulations. Extreme low SM was projected to have a greater impact on NEP than extreme high VPD in the Northern Hemisphere, though this finding did not apply to the Amazon and Congo basins in the Southern Hemisphere. The additional effect of extreme low SM on GPP was shown to be much greater than the effect of extreme high VPD for almost all land masses in future simulations, however. Zhou and colleagues also take into account the mitigating factor of the phenomenon known as CO2 fertilization, whereby the rate of photosynthesis increases in plants due to increased atmospheric carbon dioxide. In spite of this offset though, global carbon uptake is still predicted to decline. The investigators note a few uncertainties in their methods and models—for example, the fact that their models don't take into account the adaptive capacity of plants to climate change. They also call for future work to separate the effects of VPD and SM as they apply to ecosystem models, since VPD is expected to increase substantially across the globe, whereas SM projections seem to apply less universally. In conclusion, the group states, "our results highlight the importance of compound drought and aridity events and their impact on continental carbon uptake, and the need to consider these factors in evaluation of future climate change risks. 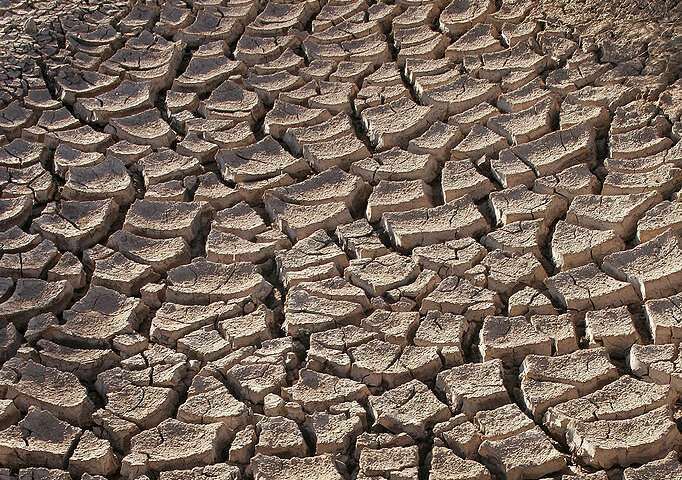 Considering the projected increases in the intensity and frequency of compound drought and aridity events in the 21st century, strategies should be developed and implemented to manage risks and improve adaptive capacity." The climate cycle known as ENSO (responsible for El Nino, La Nina) is a big driver for drought. Until we can predict that with regularity, it is hard to say when climate change is responsible for any particular extreme episode. Prpuk climate change is responsible for anything that they want it to be responsible for. The only reason that climate change is not responsible for say the next bubonic plague outbreak is the fact that it has not happened yet. Of course Co2 is not responsible for better crop yields or the greening of desert areas. Well anyway....they will never admit it. Of course if crops are harmed by cold weather the newly revised AGW 2.0 will prove that this is due to CC. So colder weather produces less drought? What complete nonsense. OK, so do you think ENSO will eventually be understand well enough to be predictable? "OK, so do you think ENSO will eventually be understand well enough to be predictable?" Can't say but I do know that climate science knows a lot less than is needed to predict the future. IMHO the upcoming solar minimum is much more of a cooling threat than any of the AGW crowd is willing to admit.
" IMHO the upcoming solar minimum is much more of a cooling threat than any of the AGW crowd is willing to admit. Afraid the sunspot cycle is but a small percentage of the sun's spectral output. Correct but the lack of sunspots allows more cosmic rays to enter the atmosphere. This increases cloud cover which reflects heat. Or so the theory goes. At last month's AGU meeting, in the same session that I presented, a group from NASA Goddard and NCAR was also presenting on "Termination of Solar Cycles and Correlated Tropospheric Variability"
I talked to the lead author Leamon at length and he claimed good correlation with the sunspot cycle to ENSO activity (and thus natural temperature variability) back over the span of a several decades. It didn't correlate before that time (at least pre-1960), as I mentioned to him, but he didn't have an answer for that. Leamon said he submitted his group's work to Geophysical Review Letters (I think) and see if it passes peer review. He does have an explanation based on cosmic ray interactions from what I understand. Prpuk it is my personal opinion that there are 100s of cycles internal and external to the earth regulating our climate. Most are poorly understood and their effects merely guessed at. Thus climate models are pretty much useless in predicting the future and even the past. Let's face it for the earth to go from an ice age to today in 26,000 years involves a lot more than Co2 levels and changes in the output of the sun. This has happened many times in the past which seem to rule out so called "Tipping Points" and infer that there are many negative feedback loops protecting the earth. Now one may ask why there are no papers showing the existence of these negative feedback loops. You see there is no money to be made there whereas tipping point research is well funded. I just had an idea as to the cyclic nature of earth's temperature. Since the cooling and warming periods appear to have very steep changes vs time they look to be almost square waves. Thus, many of the cycles comprising these "square waves" must consist of even order harmonics of the basic wave. BTW I have no real proof of this it was just an observation. missy666, just because you fail to understand the collected data or the sciences used to analyze & project that data? Doesn't mean the rest of us are as stupid as you evidence. As for the religious deniers? Scripture proclaims that the servant Joseph had dreams of Egypt's future. Seven fat years of bounteous harvests. To be followed by seven years of drought, famine & failed harvests. The servant savant Joseph, convinced the Pharaoh of the prophetic warnings. Adopt a thrifty, efficient, conservative program. To store enough provisions against future needs of ALL the people of Egypt. Came harsh times, ALL the people of the Nile assisted one another to survive. Their efforts were so successful, that neighboring nations that had failed to organize preparations for global hardships? Came to Egypt to beg for assistance. With open-handed generosity, Egypt displayed it's true glory! Selfish hoarding & rapacious denial of our common Humanity shows poor judgement.